An early start was needed on the Sunday, it was a open session on the track and due to it being my Birthday I had been bought a truly memorable experience by a few of my friends who were with me and my otherhalf who was not, a seat in one the BMW M5 Ring Taxi's. So after a nosey around the filling car park we met our driver and climbed into this 570bhp rear wheel drive monster. Our driver swiped through the barrier and then started to described what his job was as he powered down the straight to the first corner (a lot faster than I did a few days before) with one hand on the wheel. Turns out he was a chassis design engineer who also trained BMW drivers/instructors at the various BMW driving schools around the world, so we were in good hands I hoped. Putting his hand back on the steering wheel he turning in to the first corner and the G force hit me. The sear pace he kept up through the lap was staggering and to be honest over some of the blind crest downright scary!!!!! and all this with a running commentary. On the approach to one corner he tells us “this is the Niki Louda corner where he had his near fatal crash" then turns on at nearly 100mph. About half way round he slows down quiet dramatically "there are only a few sections that have a speed limit; we're approaching Adenau where there’s a second exit and entrance on to the track". You read that right, half was round you can pull off the track then re-join!!!!! why might you do this, well on the track it takes 5mins to get there, going round it take 20. Its also something i missed on my first lap. The rest of the lap involved more extremely fast over taking, extremely fast cornering and an extremely fast final straight. Basically we'd been round in under 10mins and we were al exhausted but what an experience going round at race speed. With my adrenalin still coursing through my veins after the taxi ride, my mates talked me down from taking the Scirocco out; in fact they said "you'd probably kill yourself or the car". To be honest they were probably right to stop me!!! on top of that the track was getting busy which leads me on the other reason to hang out at the car park, the cars. The mix of cars driving through and parked up, either waiting to do a lap or just hanging out was just fantastic. From 70's Porsches and BMW's, modern Ferrari's and Mustangs, Lotus 7 replicas and every type of Volkswagen!!!!! Every time you turned round there was something else driving through or parking up. We then headed back once again to Brunchenn about 11am to find a car park full of cars and to see some of the cars we'd just left hitting the track. What you also noticed was the number of cars that would be on the track and 15 minutes later would pull up into the car park. This seems to be for two reasons, firstly to give the car some time to cool down after and fast lap but secondly to come for a spot of spectating. Next we headed over to Adenau, half way round the track and that second entry point for some more viewing. With this being our last full day here we decided that another lap for all the cars was in order but we also wanted some action shots. This meant heading to yet another viewing spot, this one though was a little more challenging as neither the Golf VR6 nor my Scirocco could make it over the bump that lead to a winding country lane. What a spot though right on two tight turns, which was the same spot as the video we were watching on the first day off all the crashes. So we were in for some entertainment, well hopefully. As it turns out American vehicles don’t corner that well!!!!! With me and Lee (my co-pilot) being left here the others headed for their cars and some laps with us ready to capture the action. It was then our turn to head back to Nurburg and our second lap. Thankfully, due to a number of track closures by accidents, when we got to the barrier it was gone 5pm and the track was quiet. Also I was more relaxed about going out, so donning our racing goggles we headed out for our second and final lap. This one was much smoother and enjoyable, for a number of reasons, I was less nervous, it was quieter out there and the cars that were on the track seemed more tolerant of us foreigners. I even remembered to indicate when cars were passing. With Lee waving to the last of the spectators around the track, we got loads of waves and cheers back, we were really enjoying ourselves. Out of the whole lap my only issue was not with the car but a damn Audi R8. On approaching the Karussel I'd noticed in the mirror that one was coming up behind me so i decided to take the high route round rather than drop in to let it pass me. Getting half way round the corner it hadn’t come past, where was it? right behind me!!!!! It was the same R8 that had sent the day dawdling round and I could have taken the corner properly. I was not a happy racer after that i can tell you. The highlight of the lap though was being followed for about a kilometre by a new white Scirocco despite giving loads of room for ho to get by, obviously was enjoying following a predecessor. The lap ended on a high with a damn good blast down the main straight again with big smiles on our faces. What a great day and once again ended with a beer and some dissection of our laps, no dissection isn’t right, piss taking that’s much better. The next morning and our time at the Nurburgring was coming to an end. The track was closed to the public, so we headed back to see if any development cars were out testing. 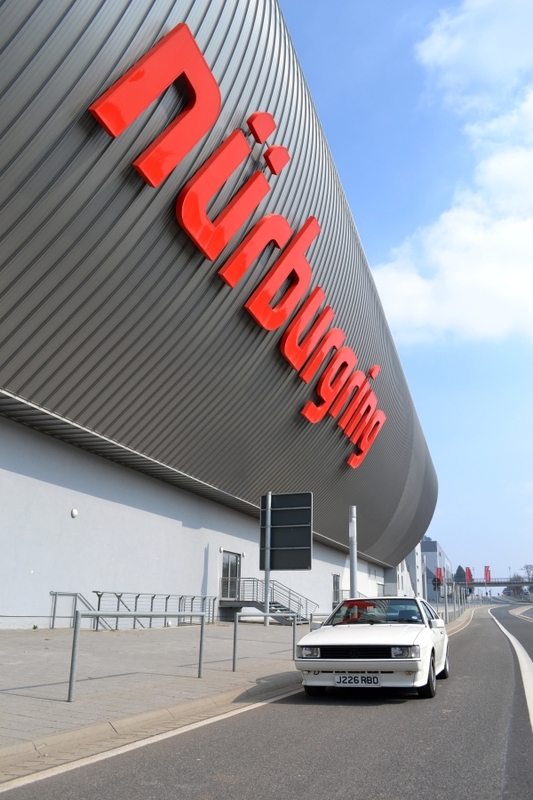 After all thats the secnd thing the Nurburgring is famous for. We'd already seen a few driving about over the last few days with their tell-tale "camo" livery. The best place for spotting though has to be a the petrol station just outside Nurburg, close to the entrance of the ring as well as the industrial estate where all the manufacturers have units!!!!! This though it no normal petrol station, looking inside its has to be one of the best stockists of car models in the area and deserves a visit in its own right. We didn’t have to wait long before three undercover Mercedes turned up before a Range Rover drove past. We had also seen Peugeot's driving round. The best was still to come when we went for a walk through Nurburg before heading for the ferry. Nurburg is home to the BMW Test Facility, no hiding that then, and as we walked past the roller shutter opened and what’s been reported in other press and new M4 came driving out!!!!!! With that bagged it was time for the 260mile drive to Rotterdam and the ferry home overnight before the last 100 miles home. In total my little VW had done 830miles trouble free and two laps of the ring more than earning its freshly applied stickers. My trip had been perfect and one of the things i had always wanted to do and now I felt strangely fulfilled after my adventure. So the what memory will I be taking from the trip, tough one, seeing rare cars, doing a lap or two, ring taxi ride, development car spotting, F1 complex we did so mush in 3 days. But it has to be the drive there and back, partially because anyone who runs a older car knows the satisfaction of actually getting to the destination and not on the back of a breakdown truck but also back home again!!!!! But mainly because of my best mate Lee sat next to me for the whole trip, we've known each other for over 30 years (we were described by the others on the trip as the old married couple, cheeky gits) and these days with families and living in different towns we don’t get together as much as we should so having a 5 day run (3 days at the "Ring") to catch up and experience it with someone as passionate about cars as me was the icing on the Nurburgring cake,.Right that’s enough of that stuff did i mention there were Lamborghini’s there!!!! Lastly our "Little Dub Club" from the trip. Nurburgring done, what’s next? Hmmm. how about the Speed Trails at Brighton for next year’s adventure.